Valentine's Day is a 1000 piece jigsaw puzzle designed by artist Tuula Burger. 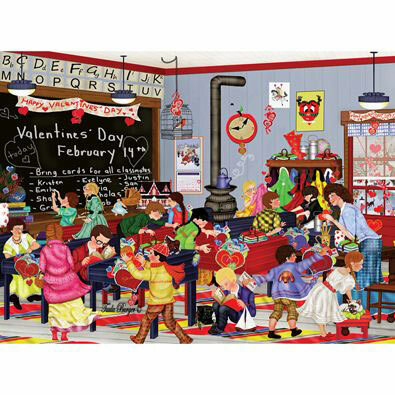 The schoolroom is filled with excitement on Valentine's day. All of the classmates and the teacher are exchanging sentimental cards and notes. Valentine Friends is a 1000 piece jigsaw puzzle designed by artist Tuula Burger. A Valentine's Day party is in full swing outdoors on a wintry February day. Heart decorations are in abundance, from the school to the balloons floating in the sky. Children play in the snow and ice skate on the pond, while a vendor sells sweet treats from his horse drawn cart.